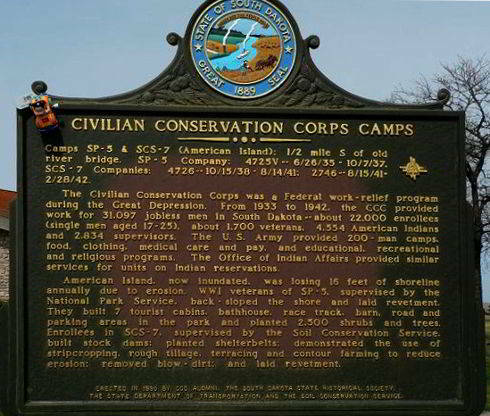 South Dakota Civilian Conservation Corps (CCC) camp 1 mi from Chamberlain, South Dakota. Camp SP-5 was on American Island across the old Missouri River Bridge from Chamberlain. Situated between the old river bed and the main channel, it was ideally located from the standpoint of beauty and recreation (1936). Across the highway--between camp and the main channel--were the Chamberlain Country Club with a 9-hole golf course and the municipal park with a swimming pool. U.S. Highway turned west from Chamberlain's main street at the corner north of the municipal auditorium, crossed the bridge, and crossed the island. The camp was on the west side of the highway about 1 mile from main street 1/2 mile from the bridge. 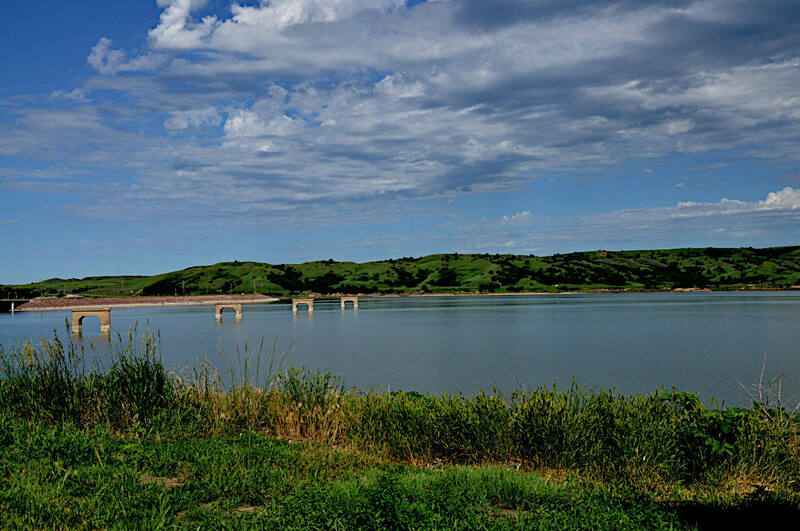 The island, park, camp, and country club were inundated during the early 1950s by Lake Francis Case, created by Fort Randall dam about 75 miles to the south. The camp was built in a rectangle around "parade" grounds. The headquarters buildings formed the end of the rectangle near the entrance and kitchen-mess hall the other end. Eight barracks (four on a side), hospital, and recreation hall formed the sides. Gravel walks, highline electric service, telephone, and its own water system made it a pleasant camp. A 100-ft flag pole was in the center of the parade ground (1936). Camp SP-5 was established in June 1935 and closed sometime between October 1937 and April 1938. The camp at American Island was later used as Camp SCS-1. A photo taken by Orrion Barger seen in the book "Around Chamberlain Postcard History Series" by authors Gene and Alice Olson with Jan Cerney, show sculptures made by Andre Boratko. 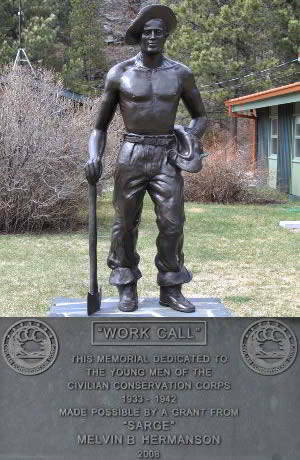 The sculptures were supported by a special Works Project Administration (WPA) artist fund. There were eagles, a coyote, a rabbit, a squirrel, and a fawn. 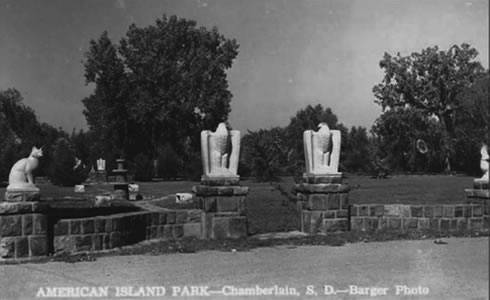 Some of these sculptures can still be seen today at public parks in Chamberlain, SD. 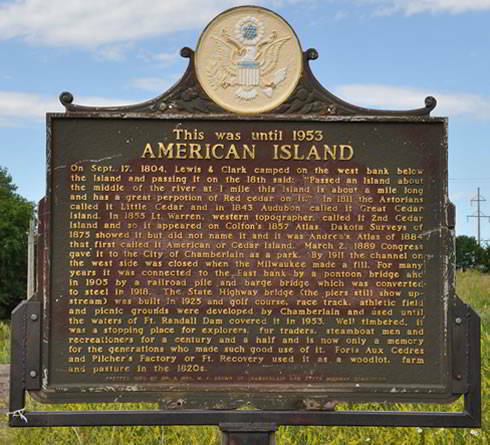 AMERICAN ISLAND - On Sept. 17, 1804, Lewis & Clark camped on the west bank below the Island and passing it on the 18th said: "Passed an island about the middle of the river at 1 mile this island is about a mile long and has a great perpotion of Red cedar on it." In 1811 the Astorians called it Little Cedar and in 1843 Audubon called it Great Cedar Island. In 1855 Lt. Warren, western topographer, called it 2nd Cedar Island and so it appeared on Colton's 1857 Atlas. Dakota Surveys of 1875 showed it but did not name it and it was Andrea's Atlas of 1884 that first called it American or Cedar Island. March 2, 1889 Congress gave it to the City of Chamberlain as a park. By 1911 the channel on the west side was closed when the Milwaukee made a fill. For many years it was connected to the East bank by a pontoon bridge and in 1905 by a railroad pile and barge bridge which was converted to steel in 1918. The State Highway bridge (the piers still show up stream) was built in 1925 and golf course, race track, athletic field and picnic grounds were developed by Chamberlain and used until the waters of Ft. Randall Dam covered it in 1953. Well timbered, it was a stopping place for explorers, fur traders, steamboat men and recreationers for a century and a half and is now only a memory for the generations who made such good use of it. Foris Aux Cedres and Pilcher's Factory or Ft. Recovery used it as a woodlot, farm and pasture in the 1920s.